With all the great innovation and entrepreneurship (I&E) programs on campus at Carolina, how do you know which ones are the right fit for you? Innovate Carolina is taking a tour of the many I&E programs available at UNC. This week, we visited the Adams Apprenticeship program to get the latest scoop on how students are learning to create change and turn their ideas into action. Learn how this life-long network of students and successful UNC alumni is shaping, supporting and speeding the transition to entrepreneurial careers with successful outcomes. What is the Adams Apprenticeship program, who does it serve and how can students get involved or apply? The Adams Apprenticeship is a program that pairs students with successful UNC Alumni who serve as mentors and advisors to launch “big breaks.” The program is open to undergraduate juniors and first-year graduate students. Each year, the program recruits 30-50 new advisors, creating a network that is now over 250 alumni. Those interested can apply on the Adams Apprenticeship website by October 1. We also have an info session September 12. What are the biggest benefits that students at UNC get by participating in the Adams Apprenticeship? The Adams Apprenticeship is a one-of-a-kind mentorship program. Whereas most entrepreneurial programs focus on the venture, the Adams Apprenticeship program goes all-in on developing and investing in the student entrepreneur. The purpose of the yearlong apprenticeship is for each student to develop a personal advisory board of mentors to help them with career advice and crossroads for up to ten years post-graduation. Students are exposed to hundreds of mentors at four main networking events throughout the year, including two in N.C., one in New York City and one in San Francisco. The coastal treks are all inclusive and include intimate tours of startups and fortune 500 companies that have UNC connections. 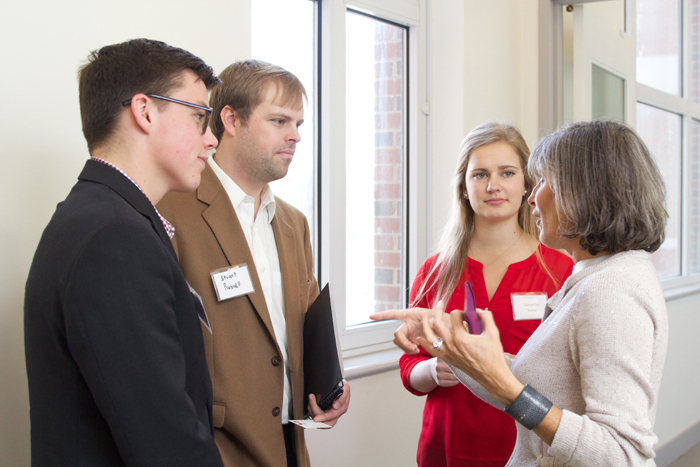 In addition, students in the program partake in Ted Zoller’s Entrepreneurship Lab course, where some of UNC’s most successful entrepreneurs come to class to speak. Past speakers range from street smart founders like Sheryl O’Loughlin, the founder of Clif Bar, to famous entrepreneurship authors like Diana Kander, author of All In Startup, to university thought-leaders like Bill Aulet, from MIT’s Entrepreneurship Center. · Cultivate key relationships among UNC alumni and friends who are successful entrepreneurs and engage them in building the Kenan-Flagler entrepreneurial network. What’s something new about the Adams Apprenticeship program, and what should people expect to see from it in the future? As entrepreneurs running the program, we are constantly thinking of ways to expand and improve the program. We have brainstormed adding another optional trek around fall break for Chicago Ideas Week and would also like to raise more money to offer the program to more students. What’s the most surprising thing people should know about the Adams Apprenticeship? A huge perk from the program that students gain is the peer-to-peer learning. They are surrounded by other students who have an entrepreneurial mindset and learn a ton from each other and feel supported by the community during and after the apprenticeship. “The Adams Program has opened me up to incredible resources and opportunities. In the last two years, I've relied on other apprentices for support, professional and personal feedback, and unique perspectives on problems. Although we all come from a diverse set of backgrounds, we are similar in our shared value system of value creation, grit, and nonstop innovation." Can you share a success story of a UNC student who participated in the Adams Apprenticeship? There are numerous success stories of students who’ve participated in the program – including Nina Luker (BA 18), who now works with her mentor at Women in Sports Tech, to Chijioge Nwogu (MBA ’18), who is pursuing one of his lifelong goals of exposing young kids to computer science through sports and gaming. Learn more about the Adams Apprenticeship.